Linen is like buttermilk, women love it or hate it. I'm a lover. There is a point where linen demands a wash-and-iron, just like your jeans when they bag. The problem with a downmarket linen is not crumple, it's boring design and sloppy tailoring. A badly-sewn linen shirt won't look soignée no matter how rigorously pressed. I'm showing linen you can wash (with one exception). Talbots make linen pants you have to dry clean, and I've seen their linen dresses lined with poly. What is the point to this madness? Look for a bit of ease in pants, from relaxed to wide leg, with enough length to brush the top of the foot. These shown are from Marks and Spencer, £22. 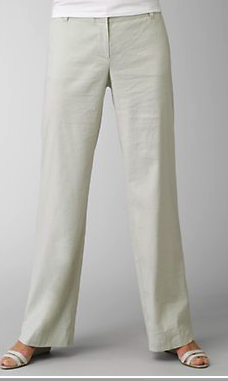 Machine washable stretch linen (linen, rayon and lycra spandex) wide-leg pants by J. Jill, in two neutrals, price, $89. Available in Misses, Petite, Women's and Tall (I love you all). I am guessing these will wrinkle less, if you care. This Eileen Fisher shaped jacket shows the desired attitude: ease, but with some shape. Price, $198. Sidebar: EF, hoping to court younger customers, is starting to shape its clothing more by adding darts and detail. Yes! It's shown layered over a scoopneck tank, with sequins at the neckline, which comes in white, black or (shown) branch, price, $138. Love it. it's EF and I love it... a first. Good linen is worth the investment, because low-quality linen is like wearing a paper bag, stiff and scratchy. But if you look, you can find good linen at decent prices. Linen worn with the average interlock t-shirt top looks tacky, and cotton knit is nasty in steamy heat. 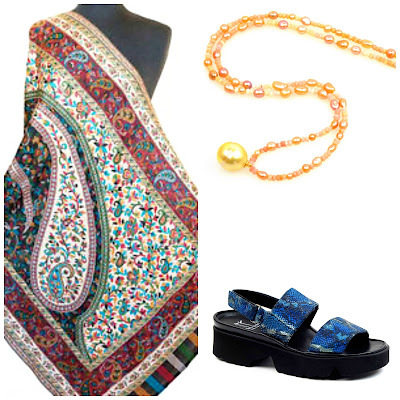 If you prefer cotton knit, look for high-quality Egyptian in extremely fine gauge. Linen jersey, however, is a perfect complement to woven linen. 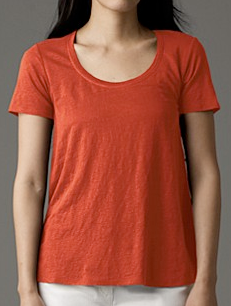 EF make a linen jersey tee with a graceful scoopneck, price, $118. Hardly a cheapie, but the look is entirely different than cotton interlock, and so much cooler in all senses of the word– so, worth it. In an array of neutrals and colours, some on sale. Sandro's ma riniere linen-knit t-shirt is another example of the chic of linen knit (s/o in all but Medium on Net-a-porter), price, $165. J. Crew are a source for interesting linen; they of ten mix it with other fabrics. A linen cardi with silk pockets: simple, smart, summery. Price, $88. I have hand and machine (delicate cycle in a mesh bag) washed their linen knits successfully. 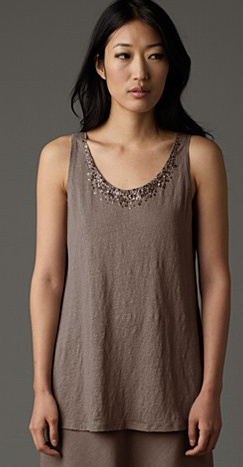 I found this Talbot's linen gauze top in the Outlet section for $14.99! I'd buy some beads or sequins and embellish the sleeve hems just for fun. If you're too busy mixing those margaritas, just pile on necklaces! Talbot's say dry clean but I'd wash by hand or on delicate cycle, hang to dry. Available in Misses, Petites and some Woman Petites sizes. Flax make an extensive line of linen, priced between $65-$135 on average. Flax can look matronly or marvelous. There are good pieces in this line. They wash like a dream, wear very well, and the size range is inclusive, from XS through 3G (for Generous). The loose, cropped Flood pant or full-length Fundamental Pant and Long Slacks are travel lifesavers anywhere hot and humid; handwash, hang to dry, no pressing needed. 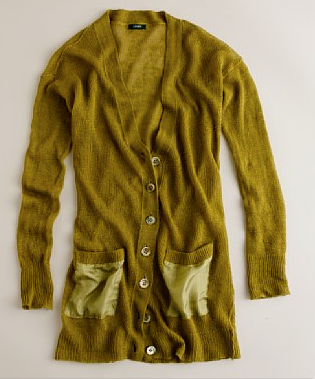 Shown, Pullover Shirt and Flattering Floods, from the Flax site. You can often pick up pieces on sale on eBay. Local Toronto designer Alexia von Beck has a shopful of outstanding linen pieces right now. Her boutique (1228 Yonge at Summerhill) carries skirts, simple pants, several styles of smart blouses and even linen coats in both summer hues and neutrals. If you can't get there, consider sewing a floaty handkerchief linen skirt or having it made. Shown, Simplicity 4595. 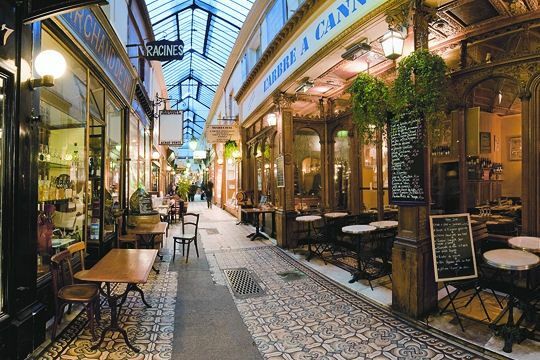 My Parisienne GF Huguette once praised me for "having your linen wrinkled just right." I had no idea! I just put it on and usually wear it more than once before washing. She me ant that stiff-pressed linen is uptight and violates its essential nature. 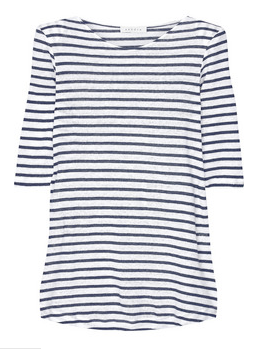 She would approve of the wrinkle factor on this Eric Bompard linen tunic, €85. American catalog or store photos show linen absolutely wrinkle free, which has loaded the weird image of linen looking tight and expressionless as a lifted face into women's minds. Moving my favourite pieces to the front of my closet, I feel the promise of summer sunshine coming off them, and smile. "..linen dresses lined with poly. What is the point to this madness?" Well, I think it's the "customers expect a lining, so we'll give them a cheap one." Linen breathes - poly doesn't, so one of the major points of wearing linen is canceled out. Toby: Agree about their thinking. Thought of cutting the lining out but was so annoyed decided not to buy dress. I love linen, including the wrinkling. Since I make my own, prewashing for that soft wrinkle is essential and nothing could be cooler in a hot, humid Long Island summer. It also redyes admirably when your blacks fade. J'adore< linen, if it's the drapey, not stiff, kind. The EF linen jersey is fabulous, and I picked up one piece (a 3/4 sleeve tunic) earlier this year. I think EF does a good job with linen...the fabric is of good quality and you're right, the cuts are getting better. I've found Talbot's linen to be stiffer than I like, even when unlined. and don't forget Motion, for those of you in Toronto great selection of linens.. I love the easy breezy feel of linen in the summer. I just wish we would get to summer. Even with the sun out it feels like February here...not linen weather yet. I haven't tried EF for several years now, but will take another look. In the past I thought their linen was good quality, it's just the style was frumpy. 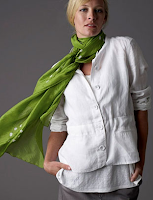 OH I'd love to have my linen wrinkled "just right"...I have some linen and flax and find them handy for the warmer summer days and evenings...what is up with Talbots lining linen pants with poly? That would be oppressively hot! I salute you for another informative and thorough post! Oh, I love those linen t-shirts. I found such t-shirts in Italy when I lived there, and they were wonderful in the summer heat, cool and pretty enough to wear crossing a medieval piazza. The EF ones are a bit pricy though - I'll have to check out which colours and sizes are on style - these should NOT be tight. I have a bit of s.'s problem - I do love linen but never find I wear it well because I'm rather a rumpled sort myself, and find it a bit hard to look elegantly put together. Much as I love pure linen and natural fibres in general, I'm thinking a VERY small quantity of lycra or some other strong plastic fabric might tame the wrinkles a bit. (I'm ashamed to say that). Of course there is no such problem with the knits. They look a wee bit rumpled, but attractively so. I love the Eileen Fisher items! Oh, how I hate those prices. As a sidenote--probably the most common items I see in my thrift jaunts are Talbots linen and Talbots silk. Often, these come complete with price tags--I think the garments are uncomfortable. Wonderful collection you've put together -- I especially love that mariniere. . . If you don't mind, Cherie would like to link over to you on this subject on Friday. Even Cherie with her extraordinary personal style, etc., etc., could never understand linen the way you do. Oh, yes, I am so over flowers. So sorry for being awol, you know how much I love and appreciate your blog. One day we'll have to go off the record so I can tell you a secret. (tishjett@yahoo.com) Pseu knows. . .
For those of you who sew, the linen slacks in the second photo look exactly like the Hot Patterns Marrakesh Drawstring Pants. There is a nice youtube video about sewing these pants. Nancy K: Black linen does fade quickly, thanks for the reminder that we can redye. Deja Pseu: Actually nice Irish linen shirts at the Gap! Never bought any of Talbot's. Laura; Motion carry Oska, whose linens are especially plush and never stiff- except for the price! Also a good selection of Flax. Alexia von Beck is somewhat less than Oska(but great sales) and I like supporting a local designer whom I know. Belle: We saw snowflakes here last week and is unseasonably cold now- but the linen is in the shops! lagatta: When I find linen knit that fits me, I buy it, usually flinching. Lycra, even a bit, is hot and I don't mind wrinkles. Kathy: They are definitely trying to tart up their image but some of the stuff is still too boxy for my taste. Tish: Of course Cherie can link! I'm e-mailing you. Frugal: Both those labels have a lot of sales, my theory is that woman go a bit nuts and then regret it, hence thrift shop full of it. materfamilias: Oh, a linen sheath is a delightful summer dress! metscan: I sometimes show European brands which can be hard to find for North American readers. But thanks to the internet, the retail world is opening up, and major US retailers like Saks Fifth Avenue now ship internationally. One day soon I predict we can get anything sent anywhere, if willing to pay the shipping. Anonymous: Yum! These look possible for even me to make. Thank you so much for sharing the link. Marks and Spencer has so many choices. I wish they were easily available in the U.S. I tried on the pants from JJill and they fit oddly. Linen pants is my favorite topic. Does anyone have any more suggestions? Check out linen from Ralph Lauren- I think there are pants this season. Had linen pants made by a dressmaker who copied mine, hardly cheaper than buying them. Got the colours I wanted though. Linen is one of the three or four "things" I will never be without with. 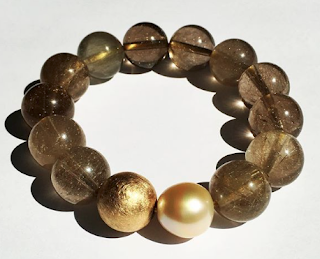 Silk is the other, wool, and ... Pearl. Grin. Chatelaine: Thanks for this fascinating tip, will try. I did not ven touch upon all linen's other lives- linen sheets, divine. I love the look of linen on others, but for myself won't go there - I just hate ironing so much, and I know that it would end up hanging in the laundry for months between wears because of the need to iron. I adore linen and find it works best for me now (at this age) in separates paired with non-rumply other separates. My hair has a lot of its own rumple so I need to be careful how much wrinkle to incorporate in clothing. I love linen so much, though, that it's worth effort to make it work. I adore linen! It is so cool in the heat and humidity and I love the way it wrinkles. I don't understand poly-lined or overly tailored linen styles though. I too tend toward a bit of rumpling rather than sleek and chic, but I find linen enhances this effect. It also seem to me that there is more allure in the effect of linen than overly crisp and polished, but that is probably just my eye. Linen knits, when I can find them and they fit, are worth every (expensive) penny. Imogen: If the linen is good quality (drapey, not stiff) you do not need to iron, just touch up the placket. Of course hang to dry. sallymandy: The point is not making so much "effort"- try it. Linen looks better not ironed into boardlike pressed perfection. 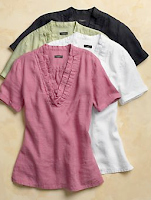 mardel: Lining linen defeats its purpose and also makes women think it has to look like cotton. What is not to love about linen!!! Countrypolitan: If I had a nickel for the women I have seen or heard shy away from it, always b/c of wrinkles. The Ferrell interior photos you post on your blog, stunning- and I suspect some linen in those. There's a company called CP Shades in the US which makes lovely organic linen pants, shirts and dresses. I bought a pair of the pants here in Australia, and the linen is gorgeous, but they have elastic in the waist, and are a bit high-waisted for my liking. I've thoroughly enjoyed your blog site, and would love to suggest silk as well as linen. In hot Asian countries silk always looks elegant and feels cool in summer and warm in winter. I live in the sub-tropical climate of Queensland in Australia, and this summer I'll be giving silk a try for the first time. Cindy: I've bought CP shades too. Silk is great if it is very loose (and lightweight), as in my beloved silk broomstick skirts from Wintersilks, perfect for travel,. But as soon as silk is close to the body, its insulating characteristics become apparent. Silk is not as breathable as linen.